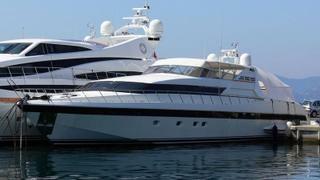 The 31.4 metre motor yacht Antares K has been listed for sale by Scott Jones at IYC. Built in GRP by Italian yard Overmarine with naval architecture by Andrea Bacigalupo, Antares K was delivered in 2001 as a Mangusta 105 model and extensively refitted in 2011 with further upgrades in 2016. An interior in high gloss cherry wood panelling accommodates eight guests in four cabins comprising a master suite, VIP suite and two doubles, all with entertainment centres and en suite bathroom facilities. Crew quarters sleep four staff aboard this yacht for sale. Antares K features a cosy living room down below and a well-appointed galley to starboard near the captain’s cabin. The main deck saloon is open plan with a dining table area, smaller coffee tables and an L-shaped bar leading to a large cockpit, making her ideal for parties. The aft deck has ample sunbathing areas along with an al fresco entertaining and dining area while forward is a further vast sunbathing area to ensure total privacy when in port. Her top speed is 34 knots and she boasts a maximum cruising range of 430 nautical miles at 30 knots with power coming from two 2,285hp MTU 12V396TE94 diesel engines. Lying in Italy, Antares K is asking €1,150,000.